Starting May 8, 2012 public comment will be a prerequisite to challenging permitting decisions. Under Section 19-1-301.5, effective May 8, 2012, a person who wishes to challenge a Permit Order may only raise an issue or argument during an adjudicatory proceeding that was raised during the public comment period and was supported with sufficient information or documentation to enable the director to fully consider the substance and significance of the issue. View Utah Code Ann. 19-1-301.5. 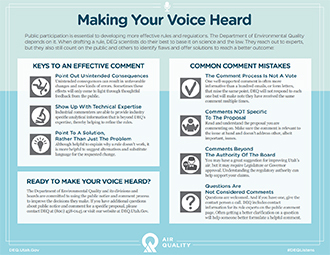 The Department of Environmental Quality and its divisions and boards are committed to using the public notice and comment process to improve the decisions they make. This guidance for making effective public comments is part of that commitment. The suggestions made in this document are not requirements, though, and DEQ continues to welcome all comments. Different kinds of agency decisions call for different approaches for making effective comments. The most effective comments have one of two primary elements in common: they request actions the agency has legal authority to make, or they provide new information the agency has not yet considered. If you are commenting on a proposed permit, for example, it is important to understand that the agency is required to issue a permit if the applicant meets the requirements of State statutes and rules. Comments that identify a problem with the application are more effective than comments that request that the agency not issue the permit because the commenter does not want a source of pollution in the neighborhood. Please visit the following links for more information to help make effective comments to the Department of Environmental Quality. Information on how and when to comment, as well as a step-by-step description of the public notice and comment process. Important information about commenting on proposed permits and licenses. Important information about commenting on proposed rules. Important information about commenting on proposed notices of violation. Understanding the standards that guide an agency’s decision is often key to preparing effective comments. Here you’ll find basic information about Utah environmental law and standards.